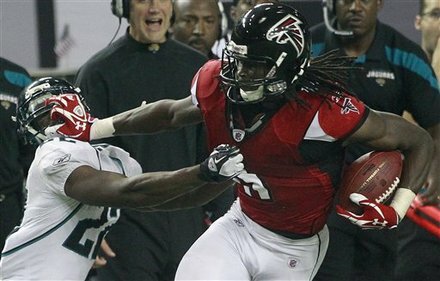 The Falcons used Thursday night’s home matchup with the Jacksonville Jaguars as a warmup for the remainder of the season, laying a pounding on the Jags 41-14 in front of a happy holiday home crowd. The Falcons fly to 9-5 with the win, while the Jagaurs fall to 4-10, breaking their very short one-game win streak after a pounding over the Buccaneers at home last week. Matt Ryan threw three touchdown passes in less than three quarters of work, John Abraham had 3 1/2 sacks and the Falcons clinched a fourth straight winning season. “Hopefully we can play like we did tonight for the next couple weeks,” Ryan said. His offensive line didn’t give him much time, and other than a 100+ yard day from running back Maurice Jones-Drew, the Jags offense was just putrid. Gabbert got most of his yards on a meaningless final drive, hitting Chastin West on a 16-yard touchdown with 59 seconds remaining. Jacksonville’s other touchdown came on a blocked punt trailing 41-0. Michael Turner burst off left guard for 15 yards on the first play of the game, and the Falcons were off and running. Ryan capped the opening drive by stepping up to avoid the pressure, flipping a short pass to Jones, then watching the rookie turn on an impressive burst of speed for a 29-yard touchdown. Gabbert got an idea of what he’d be up against on his first snap: Abraham shrugged off a blocker and threw the quarterback for a 10-yard loss. The rookie finally completed a pass on the final play of the opening quarter, but Sean Weatherspoon read out the screen and slammed Marcedes Lewis for a 4-yard loss. Matt Bryant kicked a 33-yard field goal that made it 10-0, then another brutal mistake by the Jaguars early in the second quarter helped turn this one into a rout. Jarrett Dillard let a punt slip right through his hands, and Weatherspoon fell on it at the Jacksonville 5. The next play, Michael Turner rumbled into the end zone standing to make it 17-0. It was game over at that point, as the Falcons did just about everything right, while the Jags could do very little. 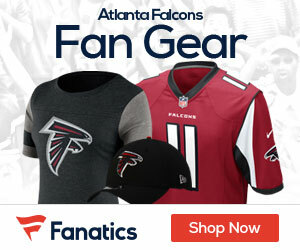 The Falcons are in position to make the postseason, but would do well to win the final two games of the season. Their biggest game of the season will take place at New Orleans on December 26th at 8:30pm.